1. Lounge in style with the EC-015 Leather Lounge Chair. This timeless lounge chair will add masculinity to any room with its rustic wood and leather finishes. 2. 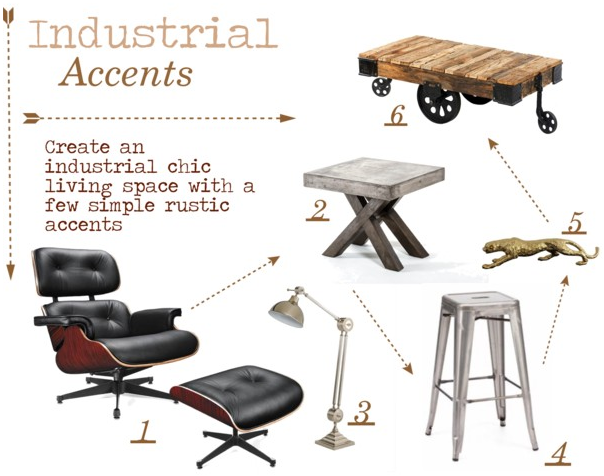 Want a different approach to Industrial Chic Accents? Try concrete. The Modrest Concrete Square End Table is the perfect way to add subtle industrial accents with a modern touch. 3. Take baby steps into the industrial look with the Modrest Silver Floor Lamp. It is a timeless piece that will instantly add a chic appeal to your room along with great functionality. 4. The Modern Grey Bar Stool is the perfect touch of the industrial look. Add a few to your kitchen bar to create a new and exciting look to your space. 5. Start small with the Modrest Jaguar Gold Sculpture. Put this stunning sculpture on any surface to add some sophistication to your space.